Chilli Parotta is a popular street food in South India, especially Tamil Nadu. 2. Saute the onions, green chillies, capsicums, ginger and garlic for a minute. 4. Add 1/2 cup of corn flour, salt, food colour to maida. 5. Add enough water and mix well to a dosa batter consistency. 6. Heat oil in a frying pan over medium. 7. Add the chopped parathas to the batter and fry in hot oil. 9. Heat little oil in a pan over medium flame. 10. Add the onions, green chillies, ginger and garlic. 11. Saute for 2 minutes. 12. Add red chilli powder, fried parottas and mix well. 13. Add little water to the remaining corn flour and add to the pan. 14. Mix well and cook for 2 minutes. 15. Add the capsicums and remove after a minute. 16. Serve with onion raita or curd pachadi or as it is. 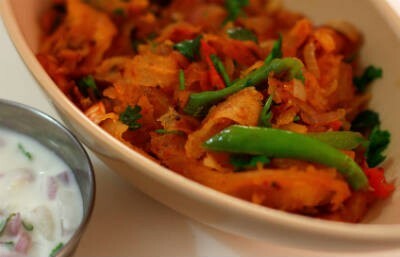 Feel free to comment or share your thoughts on this Chilli Parotta Recipe from Awesome Cuisine.